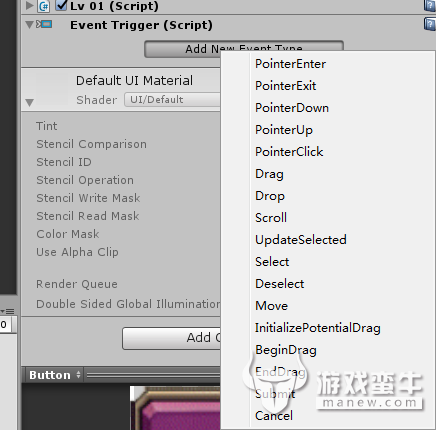 【Unity游戏开发——UnityUGUI——Button动态绑定事件】-开发者专栏-【游戏蛮牛】-游戏出海,ar增强现实,虚拟现实,unity3d,unity3d教程下载首选u3d,unity3d官网 - Powered by Discuz! [size=0.875em]The Eventsystem supports a number of events, and they can be customised further in user custom user written InputModules. [size=0.875em]The events that are supported by the StandaloneInputModule and TouchInputModule are provided by interface and can be implemented on a MonoBehaviour by implementing the interface. If you have a valid EventSystem configured the events will be called at the correct time.